WOW! PRICE IMPROVEMENT OF $55000. HAVE YOU HEARD that your HOME IS YOUR CASTLE? 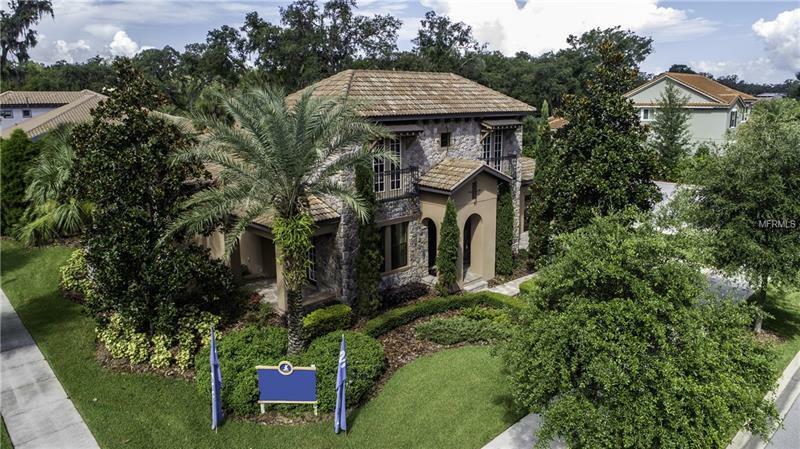 This ELEGANT MEDITERRANEAN STONE FRONT POOL HOME looks like its STRAIGHT FROM A FAIRY TALE. This FURNISHED CARDEL WALDORF BUILDER MODEL home has So many upgrades we DARE YOU to tell us whats missing. IF YOU HAPPEN to find something that you would improve upon then we have 6 OTHER FLOORS PLANS AND AVAILABLE HOME SITES TO CUSTOM DESIGN THE PERFECT FIT FOR YOU. If you are not quite ready to move the builder will LEASE THE HOME BACK from you. GET IN AT TODAYS PRICING AND INTEREST RATES. This 4 bedroom PLUS a den/office PLUS a bonus room with a full bath & wet bar features a FIRST FLOOR master bedroom PLUS a WINE CELLAR and a TO-DIE-FOR DOUBLE SIDED FIREPLACE that welcomes you as one of the main focuses of the home when entering. Dont care for carpeting? The ENTIRE HOME IS COVERED WITH TOP OF THE LINE ENGINEERED (HAND SCRAPED-LOOK) WOOD FLOORS AND ITALIAN TILE. The GOURMET KITCHEN IS BOUND TO BE THE ENVY of your Friends. YOU ARE GOING TO ENJOY the entire MASTER SUITE with its multi COFFERED & TRAY CEILINGS with crown moldings. Do you like to spend time outdoors? YOU’LL LOVE THE CUSTOM POOL/SPA AREA WITH A HUGE COVERED LANAI OUTDOOR KITCHEN TRAVERTINE TILE FLOORING AND CUSTOM WOOD CEILINGS. There’s literally too much to list. You can view the photos but you Must view the home for yourself in person to truly appreciate the quality. Make an appointment today for a private tour!